The 2018 Webster Wellness Fair, which saw interest from many students and staff with 100 pre-registering for the fair and many others who were walk-ins. The theme of this year's fair was "Invest in Your Wellness”. The fair took place Sept. 10-14 in the Sunnen Lounge. 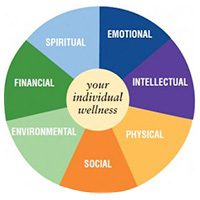 The wellness sessions encompassed topics and on-site services relating to financial, emotional, mental and physical wellness. There were also treats and giveaways each day of the fair, including samples from Smoothie King. Based on expressed interest by attendees, Weight Watchers on-site at Webster is a topic that will be followed up on in the near future. A survey has gone out to all registrants for suggestions of types of programs they would like to see at Webster and how the Wellness Fair can be improved. Please email wellness@webster.edu if you haven’t received the survey. For additional information about wellness opportunities and events, visit http://webster.edu/wellness. Get added to Webster Wellness distribution list by sending a note to wellness@webster.edu and following Webster Wellness on Facebook.